I have been asked on numerous occasions for advise on how to become a wedding planner. Although a degree in event management is obviously beneficial, nothing can take the place of experience. A good place to start is to work is in a banqueting office of a hotel, or as an intern in a company that specialises in events. Learning to deal with difficult clients takes time and patience, as people become quite stressed before their wedding, and will focus on what would seem to be quite insignificant details. However, an experienced wedding planner will realise that no detail is insignificant, and sometimes the smallest detail can make a huge difference to an event. Another aspect that a wedding planner must learn to deal with, and which can only be learnt from experience, is trouble-shooting. No amount of studying can prepare you for problems which can arise – such as an unseasonal downpour when the event is all outside, or a burst water sprinkler that sprays black water over a bride’s dress, an hour before the ceremony. A wedding planner must appear to be calm at all times, even though there are many moments of intense stress. Timing can be crucial, especially if the ceremony is to take place before sunset. Rabbis in Israel are notorious for arriving late – therefore it is a good idea to arrange private transportation for them, and thus ensure they arrive on time. 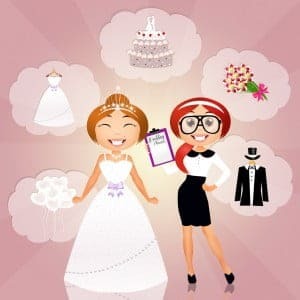 An experienced wedding planner will carry a “first aid” kit, which – besides the usual items of band-aids, scissors, etc., – will also include different coloured cottons and needles, safety pins, talcum powder to cover any unexpected marks on the bride’s dress, tissues, cotton wool, wet wipes, deodorant, hairpins, etc. etc. Its also a nice touch to place a box in the ladies toilets, comprising of hair spray, nail varnish remover, sewing kits, safety pjns and any other products that guests may need. Wedding planning is a very satisfying profession – its wonderful to watch the Chuppah, and to see everyone so happy – and to realise that you helped to make this happen.